Description...Are you in debt? Do you want a new car or a new house? Do you just want some extra money so that you can take your family on a nice vacation?I think you can answer yes to almost every question above! If you answered yes to at least one of them, then I have an incredible resource for you. If you didn't answer yes to any of the questions, this resource is NOT for you. 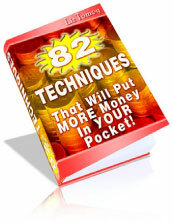 This resource is for the average Joe/Jane who is trying to save money in these hard economic times. We all want MORE out of life. Unfortunately, getting MORE out of life usually takes having MORE money. Today is THE day that YOU can start putting MORE money into YOUR pocket!